Blue Kale Road: Mango Kiwi Mascarpone Ice Cream: Birthday Time! Mango Kiwi Mascarpone Ice Cream: Birthday Time! It’s time to pull our ice cream maker out. Making ice cream is one of summer’s many, many pleasures (flip flops being another). I love dreaming up new flavors, and Sam’s 17th birthday (yes ... 17!) is a perfect time to create a frosty treat to celebrate him. I love that Sam’s birthday heralds the arrival of summer for us – a warm, sunny, fun season that reflects him well. Seventeen years ago he made me a mom and since then he has filled our lives with joy. As his mama, I can also say Sam is a kind, smart (he just crushed his SAT! ), and talented young man who makes me laugh. Lots of sweet thoughts on my mind in addition to ice cream! The anticipation of summer’s unstructured time, and yes, lots of ice cream, is a delicious feeling. Using my usual vanilla ice cream recipe as a basis, I thought about what Sam might enjoy with it. 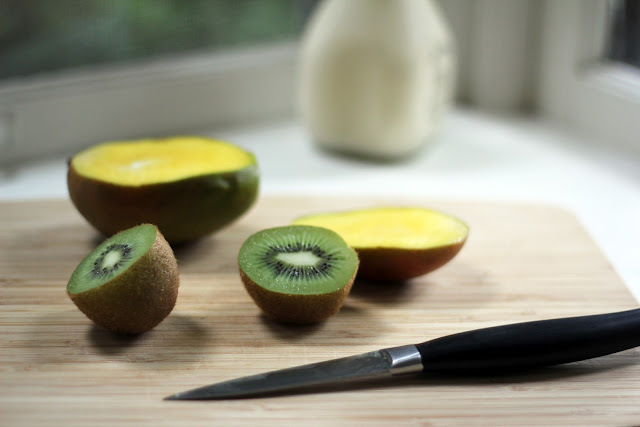 He loves mangoes and kiwis, and I decided to surprise him by combining these flavors together. I whizzed up some chopped mangoes and mixed them with the milk and cream. Some mascarpone seemed like it would add smooth, creamy decadence, so I stirred it in, too. A birthday can never have too much decadence! 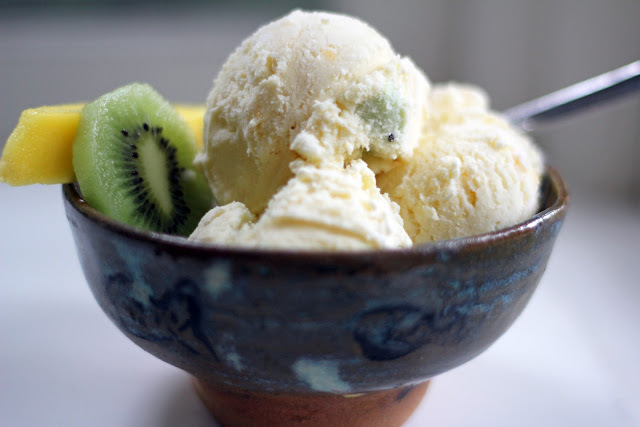 I had never had kiwis in ice cream before and was curious to try it - chopped kiwis added the final pop of flavor and color. So this is an ice cream to savor. It is rich and divine, with a delicate mango flavor and little bursts of kiwi fruitiness. It can be served alone, although we paired this batch with the angel food cake Sam requested for his birthday dessert. In a medium sized bowl, stir together the mascarpone cheese, cream, milk, 1/2 cup of sugar and vanilla until smooth. Pop the bowl in the fridge while you prepare the mango puree. Place the diced mangoes in the bowl of a food processor and whiz until it is smooth. puree mango until smooth. Remove the cream mixture from the fridge and stir in the mango puree. Pop the bowl back in the fridge. In a small bowl, stir together the kiwis and 1/4 cup sugar. Let macerate while the ice cream churns. Pour the mixture into your ice cream mixer and process according to the manufacturer’s directions. During the last 5 minutes, add the kiwis and their juices to the ice cream. Scoop the ice cream into a freezer safe container, cover and freeze until firm (a few hours). This ice cream sounds delicious! Happy Birthday to Sam, what a great way to start your summer break! Thank you, Karen! I hope your summer is off to a fun beginning (and that you eat lots of ice cream!). Hi Hannah! Wow I love this flavor. 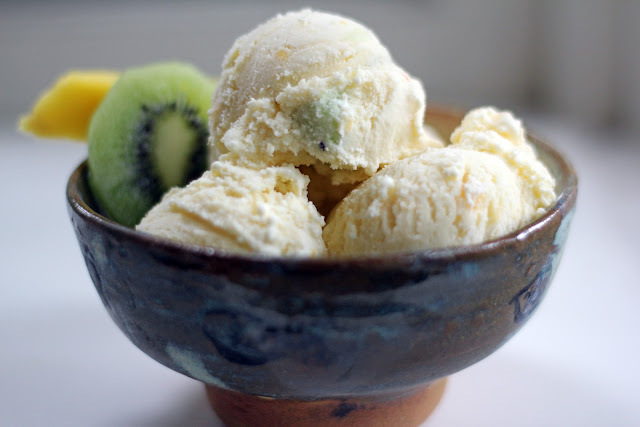 I've tried mango ice cream before but I'd love to try mascarpone ice cream (never made it before) and adding kiwi sounds extra flavorful. Happy Birthday Sam!! Thank you so much, Nami! I'll definitely be adding mascarpone to future batches of ice cream - such a rich, creamy texture and flavor. Now I'm eyeing some beautiful local cherries...I think our ice cream maker will be churning non-stop this summer! Hope you are enjoying the start of yours. This looks lovely! How interesting to add mascarpone! We're on vacation in heatwave country, I hope you guys in Seattle are getting a little bit of Summer today! Thank you, Brooke! We're in Winthrop, so it's warmer/drier than Seattle. I'll take a heatwave, though! Enjoy your travels and Happy July 4th! Love the idea of mascarpone in ice cream. Although I don't often make my own I'll sometimes mix mascarpone or cream cheese into softened vanilla ice cream and then add other flavors, Mango and kiwi sound wonderful! And Happy Birthday to Sam! Thanks, Pat! 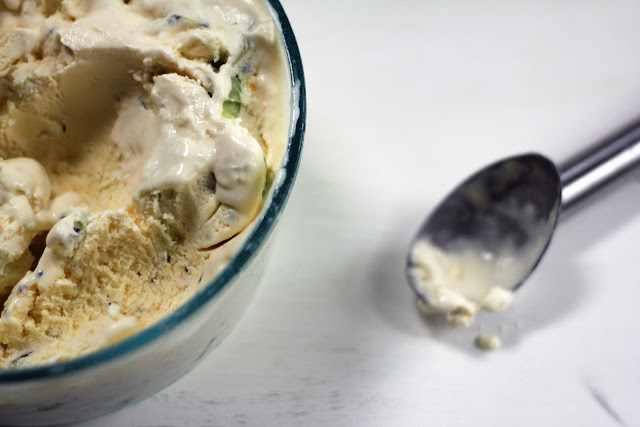 That's a terrific idea to stir mascarpone into softened ice cream...I like it! What an enticing flavor pairing! Mango and kiwi are so refreshing and most certainly announce summers arrival. Summer flavors are truly delightful, Deb - I look forward to more emerging soon! I hope your summer is off to a delicious beginning. So funny...I was just saying to my Mom last night while driving home from a delicious dinner at Duckworth's in Gloucester, how I never have ice cream in Seattle...but I come home..and want it nearly every day. I don't have an ice cream maker, but this may have pushed me over the edge. Happy Birthday Sam! Ahh, Gloucester - now I really am envious. When I moved to the West Coast many years ago, one of the first things I missed was all the homemade ice cream spots we have in Massachusetts and my ice cream eating definitely declined (although, Molly Moon's has it on the rise now ...) Eat some ice cream for me! Happy Birthday to Sam and congrats on crushing his SAT. I'm always relieved that I got to take it before it was updated. Seems like so much more work now! Thank you, Lauren! I know, SAT prep is much more involved now. I am so happy it's behind Sam now, and that we have a couple years til it's Isaac's turn. What a delicious sounding combination - I need to dust off our ice cream maker. Hope Sam had a great birthday! Thank you, Lisa! Yes, pull out your ice cream maker! I hope you enjoy lots of ice cream this summer. We had a terrific time celebrating Sam. I'm still getting my head around having a senior in high school now - I remember those days so clearly. Delicious....I love ice cream, but just too chilly for me right now! Cannot believe you have a 17 year old!! You and me both, Mairi - I'm still getting used to him being 17! Now on to college applications...it's an exciting time.